Single White (Rhino) Male Defies Age Stereotypes, Joins Tinder : The Two-Way Sudan has tender eyes, a craggy snout — and not long left to save his subspecies. So, a conservancy posted a Tinder profile for the elderly northern white rhino to raise money for fertility research. Sudan, the last known male of the northern white rhinoceros subspecies, stands for his close-up in a paddock last year at the Ol Pejeta Conservancy in Kenya. If Tinder users swipe right on Sudan's profile, they're taken to a page asking for contributions to help him reproduce. Take a good, long look at his come-hither eyes. That craggy snout. Those horns that whisper such subtle dignity. Before you swoon, just answer us this one question: Wouldn't you swipe right? The Ol Pejeta Conservancy certainly hopes so. That's why the wildlife conservancy in Kenya has done something a little unusual for the rhino called Sudan: They've posted his dating profile on Tinder. The 43-year-old northern white rhino is the last male of his subspecies — though he's not alone. Beside him at Ol Pejeta are two females, who are also the last of their kind. Together, they represent a chance for the survival of northern white rhinos, which have been hunted nearly to extinction by poachers. Trouble is, matchmaking between the three has been even more strenuous than your typical singles mixer. 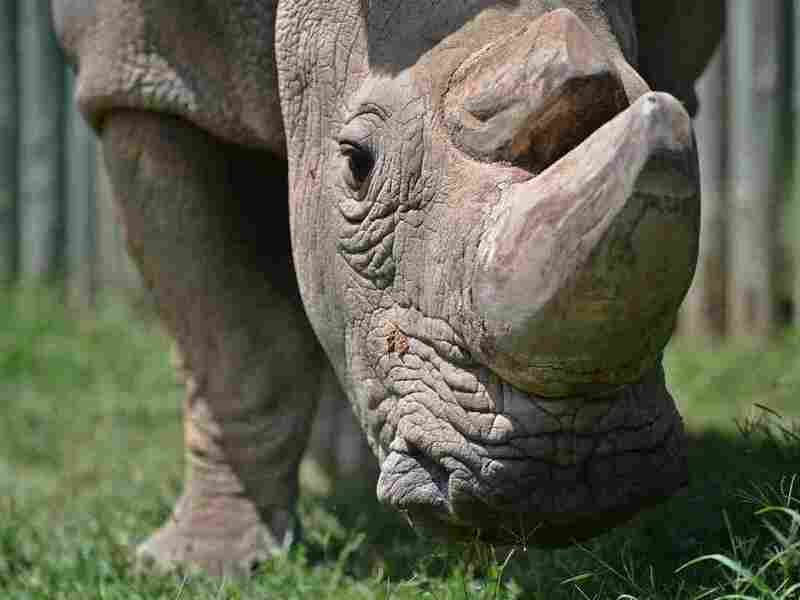 "In human terms, [Sudan is] probably about 95 years old," Ol Pejeta CEO Richard Vigne tells NPR's All Things Considered, "so he's incapable of normal breeding." They've tried just about everything to get the geezer going, but no dice. "When he first tried to mount the girl, the rangers guided him ... but it is difficult with a rhino," the conservancy's marketing manager told Reuters. "We removed them from a zoo environment, which was not conducive to natural instincts, and put them in a semi-wild environment. There were a couple of matings, but it never resulted in a pregnancy." So they're turning to extraordinary measures: in vitro fertility treatments. "It's common in humans, it's common in other domestic livestock such as cattle, but it's never been done in rhinos," Vigne tells NPR. "We estimate we need something like $9 million to $10 million." Thus the partnership with Tinder. Beginning Tuesday, when users swipe right on his profile — which appears on the app in 190 countries — they head to Ol Pejeta's donation page. Reuters reports the page received so many hits it crashed within hours of Sudan's profile going live. And that's a good thing for Sudan, who is in the market for more than just a May-December romance. With his advanced age, and his life so threatened by poachers he's kept under armed guard, Sudan doesn't have long to find himself a suitable hookup. So, when this would-be suitor makes some extraordinary claims — "I don't mean to be too forward, but the fate of my species literally depends on me" — for once, you can feel comfortable trusting him.